The Date/Time macro allows you to insert the current date and timestamp in any program. You can even insert a date in the past or in the future using the timeshift feature. 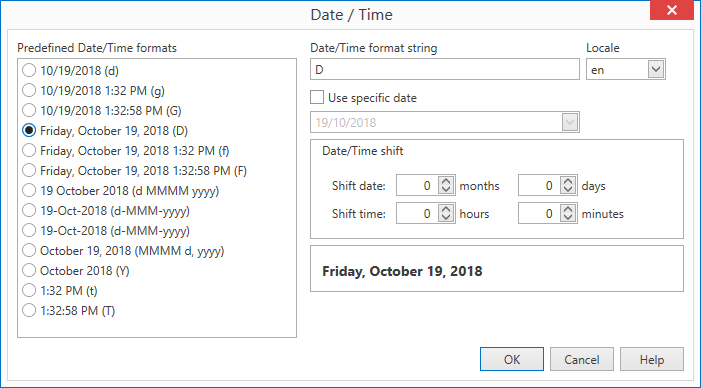 Use these format strings in the Date/Time format string textbox to customize how the date is displayed. ddd The abbreviated name of the day of the week. dddd The full name of the day of the week. h The hour in a 12-hour clock. Single-digit hours will not have a leading zero. hh The hour in a 12-hour clock. Single-digit hours will have a leading zero. H The hour in a 24-hour clock. Single-digit hours will not have a leading zero. HH The hour in a 24-hour clock. Single-digit hours will have a leading zero. m The minute. Single-digit minutes will not have a leading zero. mm The minute. Single-digit minutes will have a leading zero. MMM The abbreviated name of the month. MMMM The full name of the month. s The second. Single-digit seconds will not have a leading zero. ss The second. Single-digit seconds will have a leading zero. tt Represents the A.M./P.M. designator. The A.M. designator is used if the hour in the time being formatted is less than 12; otherwise, the P.M. designator is used. yyy The year in three digits. If the year is less than 100, the year is displayed with a leading zero. yyyy The year in four or five digits (depending on the calendar used), including the century. Will pad with leading zeroes to get four digits. Thai Buddhist and Korean calendars both have five-digit years; users selecting the "yyyy" pattern will see all five digits without leading zeros for calendars that have five digits. Exception: the Japanese and Taiwan calendars always behave as if "yy" was selected. yyyyy The year in six digits. Will pad with leading zeroes to get six digits. Exception: the Japanese and Taiwan calendars always behave as if "yy" was selected. The pattern can be continued with a longer string of "y"s padding with more leading zeroes. z The time zone offset ("+" or "-" followed by the hour only). Single-digit hours will not have a leading zero. For example, Pacific Standard Time is "-8". zz The time zone offset ("+" or "-" followed by the hour only). Single-digit hours will have a leading zero. zzz The full time zone offset ("+" or "-" followed by the hour and minutes). Single-digit hours and minutes will have leading zeros. For example, Pacific Standard Time is "-08:00". : The default time separator. / The default date separator. \ c Where c is any character. Displays the character literally. To display the backslash character, use "\\".